You will need 250g. of DK, 150g in yellow and 100g in blue, 4mm crochet hook and a bit of patience. This pattern is super easy, all you need to know before starting this blaknet is how to make a double crochet and how to crochet two double crochet together; the tricky part is the first row where you need to count the dc. All the rest is easy. I would adwise you to make a gauge from the yarn you want to use in the blanket. For the gauge chain 18, dc into the 3rd chain from the hook, dc into next 5 chains, make 2 dc into the next chain, make 2 dc into the next chain, dc into next 5 chains, dc 2 tog, turn. For the second row chain two, dc into next 6 chains, make 2 dc into the next chain, make 2 dc into the next chain, dc into next 5 chains, dc 2 tog, turn. Repeat the second row a couple more times. 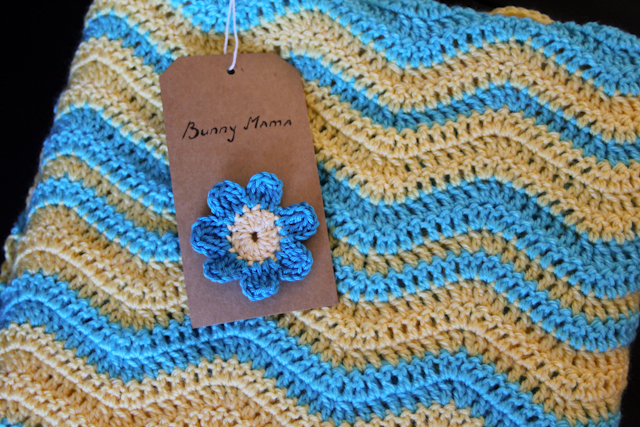 This is how ONE of your blanket ripple "waves" will look. 9 of them will make this partikular blanket. By making it you can understand how big your blanket will be. If you want to make you blanket wider simply change the number of times you crochet from * to * (point 6 of row 1) and repeat it every row. Row 2:chain 2, dc in next 6 dc, 2 dc into the next dc, * 2 dc into the next dc, dc in next 5 dc, dc 2 tog, dc 2 tog, dc in next 5 dc, 2 dc into the next dc*, repeat from * to * 8 times; 2 dc into nxe next dc, dc in next 5 dc, dc 2 tog. 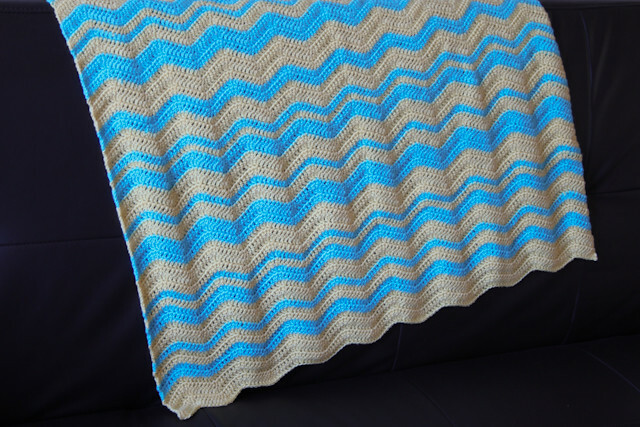 If you want to make the blanket longer, skip last 2 rows blue and 5 rows yellow, and repeat from the top - 2 blue, 1 yellow, 3 blue and so on till you are satisfied with the lenght. Then, after finishing your last rows in blue, make 5 rows in yellow to finish the blanket. In this case you obviously will need more yarn in both colours. If you make a blanket with this pattern I would be really happy to see you results, so any pictures or links to them are appreciated in comments. As well as any questions. Just ask and I will be glad to help. I am an editor of AllFreeCrochetAfghanPatterns.com and we are updating our system. I would love to feature your patterns on my site with full credit to you. I know my readers would just love it and in return would generate some nice traffic to your site. If you agree and would like us to feature your project, our readers will simply click the link to your blog to get your full tutorial. It's really that simple. I see you have lots of great patterns on your site and I would be interested in featuring even more! If you are interested in featuring more projects with links to your site, I can create a nice bio page for you as well as one of my Featured Crochet Designers. This page will include your bio and links to your site as well as any social media you would like to promote. My site is part of Prime Publishing and we publish 19 cooking and crafting web sites. We have over 3.5 million active e-mail subscribers and about 10 million page views per week. You can learn more about us at www.primecp.com. Please let me know if you would like to get started. Just a reply to this e-mail is all it takes.